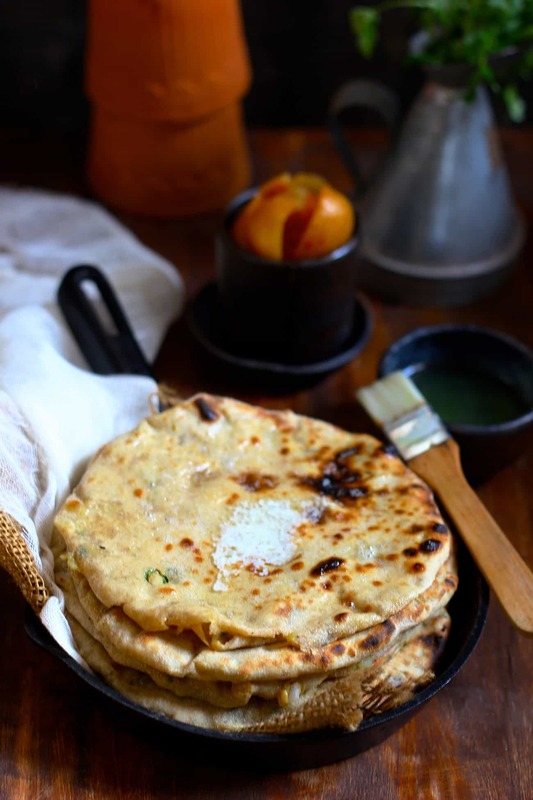 Stuffed Parathas are favourite breakfast in every Punjabi household. From the array of stuffed parathas, Gobi Paratha is our personal favourite. The freshly grated cauliflower seasoned with mild spices and tucked inside the thick layer of dough is what makes Gobi Paratha truly delectable. For Gobi Paratha, the cauliflower is not cooked simply grated. Hence, the cooking time for Gobi Paratha is less than 30 minutes. This makes Gobi Paratha a real simple and easy to cook stuffed paratha recipe. 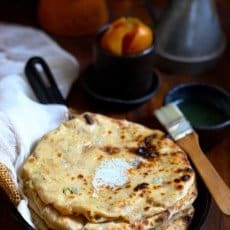 The trick to cooking a perfectly stuffed Gobi Paratha or any other layered paratha is to fill the pastry with a right amount of filling. The excess filling would surely ooze out from the sides of the paratha while rolling it. We use two tablespoons of filling to stuff each paratha. But you can surely stick to a standard spoon measurement to fill an equal amount of stuffing in each paratha. The freshly grated cauliflower seasoned with mild spices and tucked inside the thick layer of dough is what makes Gobi Paratha truly delectable. To make stuffing for the Gobi Paratha, rinse the cauliflower and pat dry with a clean kitchen towel. Grate the cauliflower in a food processor or using a manual grater. Transfer grated cauliflower in a bowl. Set aside. Now knead the dough for the paratha. Knead the dough for 5 - 10 minutes. Cover the dough and set aside. The dough for the Gobi Paratha is similar to that for Phulka/Chapati. Now combine the remaining ingredients for the paratha stuffing with the grated cauliflower. 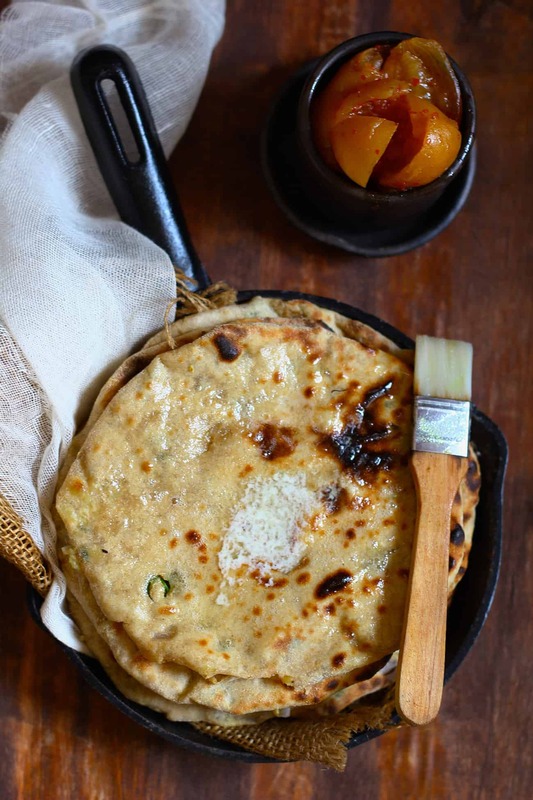 To make the Gobi Paratha, heat a griddle pan over medium heat. Roll out a small disc about 3 inches in diameter from the dough ball. Add a few tablespoons of the grated cauliflower mix in the center of the rolled out disc. 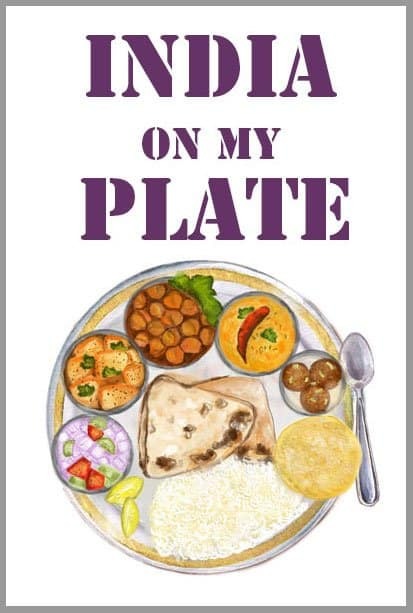 Be careful as not to understuff or overstuff the paratha. Bring the edges of the dough, join them and flatten them. Now roll the stuffed parathas gently to a size of a chapati or roti. Cook the the gobi paratha on preheated griddle by smearing a teaspoon of ghee/oil till browned and uniformly roasted on both sides. 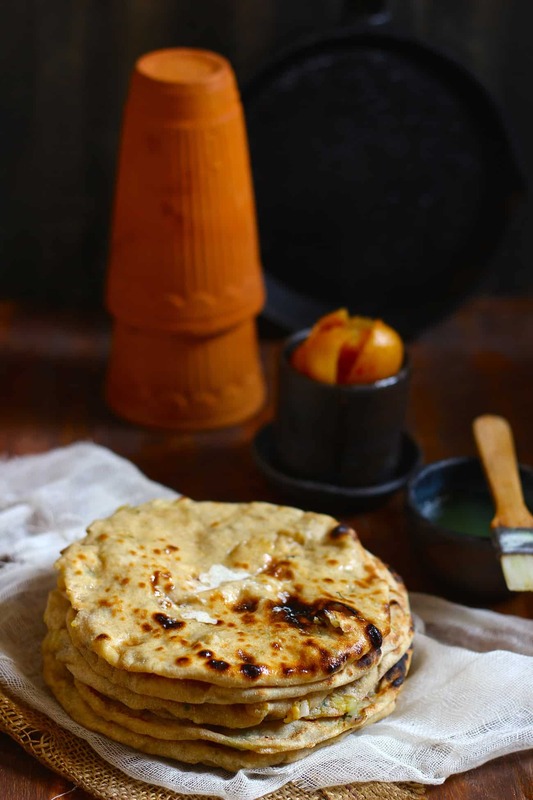 Serve Gobi Paratha warm with yogurt, pickle or white butter. Mouth watering recipe! I’m missing the cauliflowers. They are really expensive and tasteless. They’ll be available in the winters.